An ingenious interpreter of grand Western portraiture traditions, Kehinde Wiley is one of the leading American artists to emerge in the last decade. This spring, the museum acquired the artist’s most recent work. Since ancient times the portrait has been tied to representations of power. Wiley’s paintings are highly stylized and staged, and draw attention to the interplay between a history of aristocratic representation and the portrait as a statement of power and the individual’s sense of empowerment. For this canvas—based on a Jean-Auguste-Dominique Ingres stained glass window depicting St. Anthony of Padua—Wiley asked a young man in New York to be his model. The formal pose contrasts sharply with the man’s contemporary street clothes, objects and emblems, including a Black Panther patch. 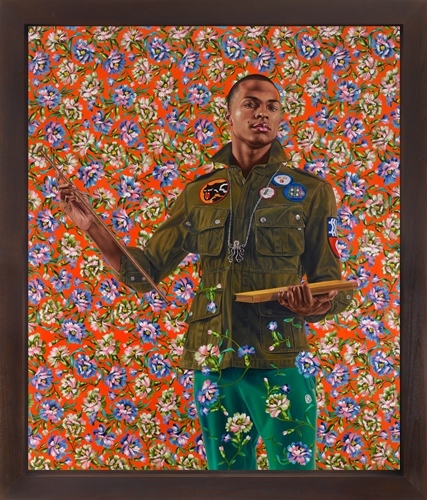 Anthony of Padua, 2013, Kehinde Wiley (American, born 1977), oil on canvas, 72 × 60 in., General Acquisition Fund, 2013.8, © Kehinde Wiley, image courtesy of the artist and Roberts & Tilton, Culver City, California. Currently on view in the European Art galleries, fourth floor, SAM Downtown.